Ben is a partner and the Head of Limited Partner (LP) Engagement and Partnerships at Portag3 Ventures. 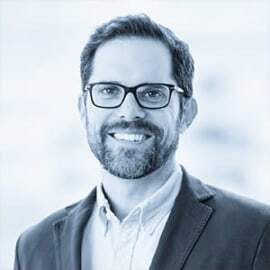 Prior to joining in 2018, Ben spent over 15 years at Great-West Life/London Life/Canada Life in several strategy, product development and marketing roles across the organization, most recently as the Head of Innovation for Canada. He has been an active and valued participant in the Portag3 ecosystem since the fund’s inception helping to establish a number of portfolio partnerships with LPs and acting as an advisor to several of the portfolio companies. Ben is a graduate of the business administration program (BBA) from Wilfrid Laurier University and is a past Chair of corporate United Way campaigns.